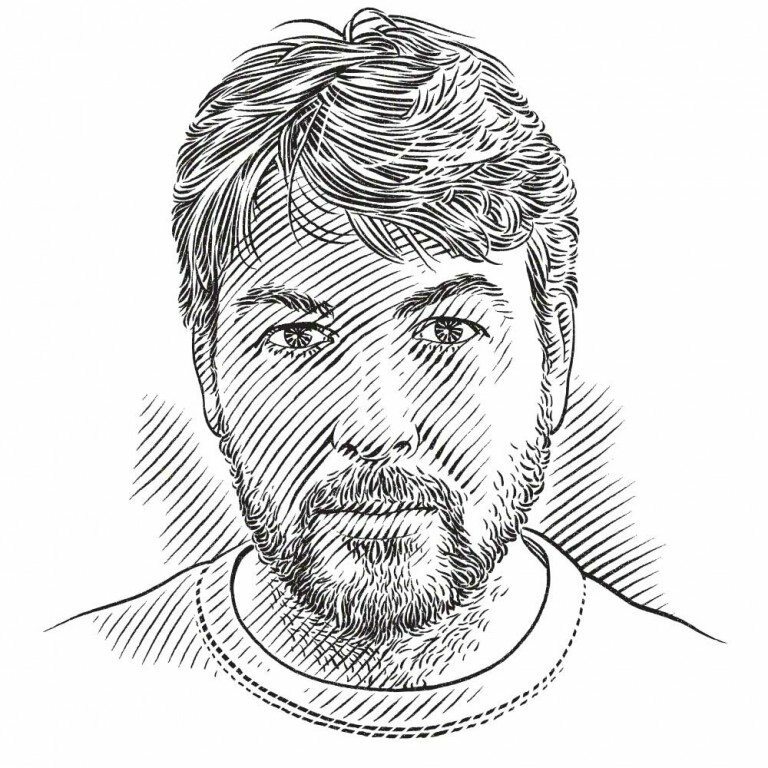 Demian Chapman, assistant professor at Stony Brook University’s School of Marine and Atmospheric Sciences, paints an emerging portrait of the oceanic whitetip shark Carcharhinus longimanus. An oceanic whitetip displays its distinctive long and rounded pectoral fins. The oceanic whitetip shark Carcharhinus longimanus is an enigmatic animal. One of only a handful of sharks that has evolved to live in pelagic waters off the continental shelf, it thrives in a hostile environment alongside some of the ocean’s fastest hunters, like tuna and billfish. It probably even preys on these swift giants, though we have no idea how the bulky and seemingly languid oceanic whitetip could manage this feat. I have been fascinated by this species since I first saw it in Peter Gimbel’s 1969 film Blue Water, White Death: the Hunt for the Great White Shark. The film culminated in some of the first footage ever seen of white shark cage-diving, yet it was the images of Gimbel’s crew diving among scores of large oceanic whitetips off South Africa that seemed more impressive to me. So when my friends and colleagues Lucy Howey and Dr Lance Jordan from Microwave Telemetry asked me if I wanted to help them study this little-known species I was immediately hooked. Microwave Telemetry manufactures pop-off satellite archival tags (PSATs) that enable researchers to track marine animals remotely. Lucy and Lance felt that they could use this technology to shed new light on the lives of these blue-water apex predators. There are two major obstacles that stand in the way of getting to know the oceanic whitetip. The first is obvious and common to all pelagic sharks and rays: the species lives far from land, at least for most of the time. The cost and logistical difficulties involved in observing it are orders of magnitude greater than those involved in observing, say, a shark associated with coral reefs. In most parts of the world the only people who regularly interact with oceanic whitetips are open-ocean commercial fishermen such as long-liners and purse-seiners. Scientists rarely have the opportunity to study them. The second barrier to researching the oceanic whitetip, at least in contemporary times, is that it has become quite rare – a situation that would probably have been unthinkable in Jacques Cousteau’s era. In those days, anyone who regularly boated, fished or swam in warm, deep blue water had a story or two to tell about whitetips. In the space of a few decades, however, industrial pelagic fishing fleets have had a massive impact on the species. Whitetips readily took bait intended for the more valuable tuna and billfish and were well known – and hated – for attacking hooked fish. Hemingway immortalised this habit in The Old Man and the Sea when the great catch of Santiago, the principal character, was ultimately annihilated by a pack of sharks. If the story were true, the sharks would almost certainly have been whitetips. So when a whitetip was hooked in the early days of pelagic fishing, it’s a safe bet that it was not released gently back into the water. The problem for whitetips ratcheted up a notch when the Chinese economy boomed in the closing decades of the 20th century and, as a consequence, a market for shark fins developed. The popularity of shark-fin soup as a delicacy surged when the newly wealthy middle class in China began consuming all manner of luxury dishes in hitherto unheard-of quantities. Although the large, rounded fins of the whitetip (called ‘rolling ball’ by fin traders) are not especially coveted as fins go, they were good enough. More importantly, large quantities of them could be readily obtained by fleets on the high seas. And so the great liquidation of Carcharhinus longimanus began. Marine scientist Dr Shelley Clarke estimated that the fins of between 400,000 and 1.5 million oceanic whitetips were traded globally in 2000 alone. Her team later showed that between 1996 and 2009 the catch rate for this species plummeted by about 90% in the South Pacific, providing compelling evidence that fishing pressure had surpassed sustainable limits. This certainly rang true for me. In 2010 I visited a shark fin exporter’s warehouse in Suva, Fiji, the global hub to which shark fins from all over the South Pacific are transported before onward shipment to Hong Kong. Dried shark fins were stacked in piles that I could have climbed – and more than a quarter of them were from oceanic whitetips. We have less data on this species in other parts of the world, where in many cases the largest declines probably occurred earlier than in the South Pacific. But the result appears to be the same: there are many old-timers’ stories about encounters with oceanic whitetips, but very few or none from recent years. Lucy and Lance were keen to use their PSATs to learn how we can better protect oceanic whitetips and restore their populations. When we began to think about studying oceanic whitetips in the Atlantic our initial question was, ‘Where?’ My wife, Debra Abercrombie, gave us the answer. Then working for the National Marine Fisheries Service Pelagic Observer Program, Debbie knew who to talk to in the fishing community. Their recommendations were unanimous: Cat Island in The Bahamas. Anglers spoke of recent encounters with whitetips close to the island in spring, when the sharks often trailed the boats and attacked hooked gamefish before they could be boated. Friends and colleagues Sean Williams, Annabelle Brooks and Dr Edward (Edd) Brooks from the nearby Cape Eleuthera Institute rounded out the team to scout the site and see what we could do there. Low on funds but high on hope, the first expedition took place in spring 2011. Subsequently funded by the Save Our Seas Foundation, the Moore Bahamas Foundation and the Pew Charitable Trusts, we have been there every spring since to find out more about the region’s whitetips, where they go and what they do. What we experienced on our initial visit was nothing short of a lost world in which the whitetip still rules the blue. My first meeting with Cat Island’s whitetips took place about a mile offshore on a calm, clear spring morning. Edd and Sean had taken one of the institute’s boats, the Cobia, out at dawn and had started chumming. As the rest of us packed up a smaller skiff, the vessel we planned to tag sharks from, they called us over the radio to let us know that five big oceanic whitetips had already found them. I was pretty anxious to get out there; having worked with a wide variety of shark species, I know that sometimes you have only a few minutes to see them before they move on. Now that I have worked with a large number of the Cat Island whitetips, I know that we could have stopped for a cooked breakfast without losing them. These sharks shadow boats for hours on end. First impressions are usually good impressions. After hundreds of encounters I can unequivocally say that the oceanic whitetip is the boldest of all the shark species I have worked with, which include many other apex predators like white, tiger and bull sharks. Unlike these species, the whitetip spends nearly all its life in open blue water, where prey is patchy and very hard to find. Even in the vicinity of Cat Island and its fringing reef, the local whitetips do not feed on reef fish, as Dr Dan Madison of Stony Brook University has shown by using chemical tracers. The research is ongoing, but it is likely to indicate that the whitetips’ diet consists mainly of other pelagic fish. This could explain the species’ boldness, which may ensure that it takes advantage of a potential feeding opportunity whenever one occurs. Or it could be that whitetips at Cat Island have a higher probability of being hungry than related coastal sharks, which live in a more productive habitat. That is not to say that whitetips immediately attack potential prey. Far from it; they often circle for hours before feeding. When they arrive, however, they are dogged in their approach and closely circle anything they think might be food. When they ultimately decide to feed, often prompted by a critical mass of several sharks accumulating in the area, they are aggressive and efficient. We have seen sharks 2.5 metres or more in length eating individual pieces of fish smaller than a scrap of sashimi that you might find on your plate. From the beginning, our primary research question has been: where do these sharks go when (and if) they leave Cat Island? This is interesting from a conservation perspective because they are ‘safe’ while they are in Bahamian waters (commercial shark fishing is not permitted), but if they leave they may encounter commercial fishing gear such as long-lines. We are also interested in the purpose of their migrations: do they move away from Cat Island to mate and give birth, since we never see young sharks or evidence of mating at Cat Island? The answers to these questions have started to materialise. Having fitted 11 females with PSATs in the first year of the study, we were able to reconstruct their movements and decipher some patterns. 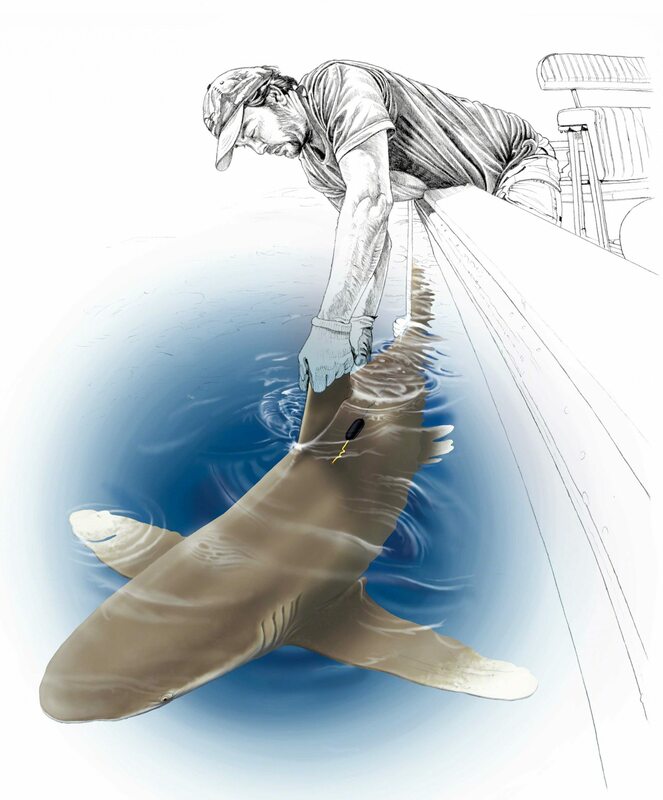 First, about one-third of the tagged sharks stayed in The Bahamas for the whole year. This was a surprise, given the fact that oceanic whitetips are characterised as a highly migratory species. Two-thirds of the tagged sharks, however, lived up to this characterisation by travelling thousands of kilometres from The Bahamas for the summer, when the sea surface temperature through most of the western Atlantic warms to above 26oC. Some of these sharks went north, to an area between North Carolina and Bermuda. The rest headed east to a section north of Puerto Rico, and some of these later continued to the northern area. All these migratory sharks returned to The Bahamas in the autumn months. We even saw some of them in subsequent years back at Cat Island, a stone’s throw from where they had been tagged. In later years we increased our sample to nearly 90 sharks and, with a few exceptions, found the same three migration patterns. We now suspect that some of these large movements may relate to reproduction. Regardless of their underlying motivation, whitetips are mobile but clearly spend much of the year in The Bahamas where they are relatively safe. Perhaps this is why we can still find them there, in contrast to so many other regions where the species has been depleted. In any event, this finding helped inspire The Bahamas to argue for stricter international controls on the trade in oceanic whitetips, which were ultimately adopted under the Convention on International Trade in Endangered Species (CITES). We still have a lot of work to do because oceanic whitetips are full of surprises. Although these sharks normally spend almost 100% of their time in the upper 200 metres of the water column, the PSATs have logged them occasionally diving to below 1,000 metres. The deep dives almost always occur at night and fit a profile whereby the shark descends quickly, spends a few minutes at depth and then ascends slowly. Why would whitetips venture into cold, dark water and spend hardly any time there? Prey would be rare at those depths. Researchers studying other large marine vertebrates, including other shark species and tuna, have recorded similar deep diving, so it is possible that such dives incur a universal benefit. If we can work out why the whitetips dive like this, perhaps this universal benefit will be revealed. Remaining mysteries aside, we are in an exciting phase of our research: a portrait of Cat Island’s oceanic whitetips is starting to materialise. These blue-water apex predators can be highly migratory, but their voyages seem to have purpose, with clear way stations that the sharks are able to relocate year after year. This trait may help humankind save this species by enabling countries like The Bahamas to successfully enact protective legislation for them. If other countries follow suit and cooperate on conservation, perhaps the oceanic whitetip will once again exert its rule over the world’s blue waters. Oceanic whitetip sharks are formidable predators that have carved out a niche in the open ocean where prey is scarce. Once plentiful, they are now in serious trouble, but Demian has discovered an aggregation site that represents hope for one of the boldest fish in the ocean.